As you consider writing business plan elements and putting your plan together, where should you begin? This is a particularly important question if you don’t have a business background or if you’re not completely confident in your writing abilities. The task of putting together a business plan can seem overwhelming. Take heart. Like eating an elephant, writing a business plan can be broken into manageable steps. You can do it just one bit at a time. But first things first. A business plan is a written outline. It focuses on how your organization is structured and funded. A business plan explains your infrastructure, operations, economic needs, income streams, and potential income sources. The plan also lays out the route you intend to take to manage daily operations and grow revenues. It is essential regardless the size of the organization. 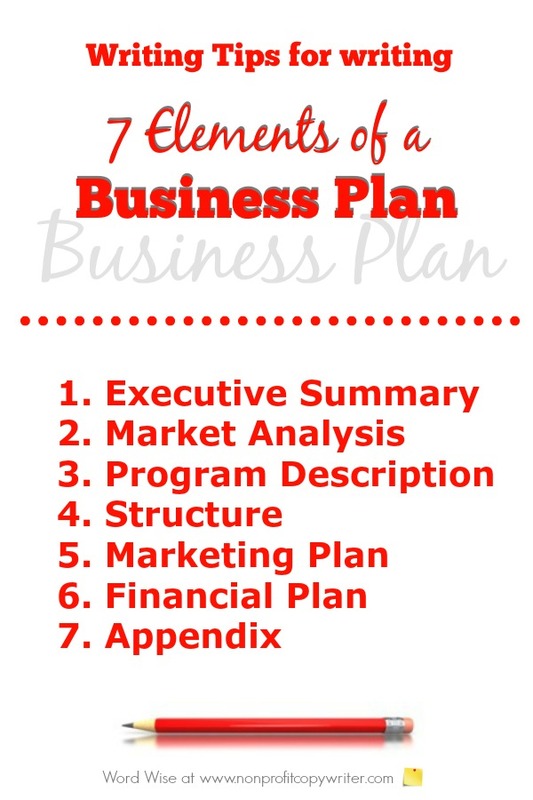 A typical business plan includes the 7 elements listed below, yet that number isn’t set in stone. As you write your plan, include the pieces of information in this list but present them in a structure that fits your organization. For instance, you may wish to combine one or more of the components on this list. Or you may separate out parts of one element to make two or more. Work to achieve completeness and clarity in your plan. Bottom line: this list is a starting point. Use it as a template to get going. The first section of a business plan is the executive summary, which offers an overview of your organization and basic identity information. Here is where you explain the purpose of your organization and how you go about achieving it. You can include your organization’s mission, vision, and history in the executive summary. Explain your niche: the problem in the marketplace you help solve, facts about that service area, and statistics that document the need. Profile your target market. Who do you serve? What outcomes do they experience as the result of your services? This section should also identify other organizations that serve your constituency and explain how you are different from them. Describe your organization’s approach to the problem you address in the marketplace. How do you meet the need presented in your target market? What programs do you operate and what outcomes do they achieve? Include intangibles that contribute to your programming success. This section may be divided into different parts, depending on the size and scope of your work. Governing structure. Explain how your organization is governed: do you operate with a board of directors, a board of advisors, professional consultants? What are their roles? If you are a for-profit entity, then explain investor and shareholder structures. What accountability systems are in place? Operational structure. A separate segment in this section explains staff roles, with a breakdown of who handles specific responsibilities. You may also want to include projected staff additions, with clear benchmarks indicating when staff can be added. A flow chart in this section or as an addendum in the appendix is a helpful way to visually explain your organization’s governing and operational structures. When it comes to writing business plan elements, this section outlines how you plan to engage your target market : beneficiaries, volunteers, and supporters. How will you communicate your services to potential beneficiaries? How will you communicate opportunities for volunteers to join you? How will you communicate your outcomes and make a case for support to partners? The marketing plan details your approach to communicating with your the target markets, including clear identity and branding, promotional materials (print and electronic), and your ongoing communications. What strategies will you use? Who is responsible for each? How will you measure outcomes? The financial plan addresses your approach to acquiring revenue to fund your operations. Projected expenses. Address organizational expenses in your attached budget, formulated with the help of your agency accountant, staff member, or financially-skilled board member. Provide realistic projections on costs so that you can make a credible plan. Projected income. How will your organization be funded? As you list all potential revenue streams, include detailed explanations for your approach in acquiring them: business partners, sponsors, major donors, monthly donors, annual donors, government grants, foundation grants, subscriptions, and fundraising events, for instance. Depending on how you go about writing business plan elements, you may want to add a funding request component and historical financial information in this section, which you can tweak appropriately for each funder. Balance sheets, cash flow statements, and quarterly/annual/2-5 year projections are also helpful documents to include as appendices to this section. Include extra documents in the section that are pertinent to your organization’s operational and financial structure: organizational flow chart, current fiscal year budget, a list of the board of directors, your IRS status letter, balance sheets, and so forth.